From the Kitchen... to the Bar! Wizards has updated their restriction policies regarding age and alcohol service. Play spaces and sanctioned events no longer prohibit alcohol, and can be age restrictive, leading to the future (and likely) possibility of games at adult venues such as pubs, adult gaming centers, and the like. That’s enough Little Jon for the moment. By now you may have heard that WotC has updated their terms regarding organized play, as stated in their release. As an adult paper MTG player I find that this provides increased opportunity to play amongst my peers. It is not often that we are able to schedule a Friday evening together to meet up at the LGS to play. We are more likely to gather at a BBQ and have a game night or meet up for a beer or two and some spell slinging. Imediately after the WPN announcement there was a figurative ‘buzz’ on the intenet. This article focuses on a single aspect of that buzz: the bar-game deck tech. It’s important to note that this deck is non-sanctioned due to the use of Un-set cards, and though it is ideal for bar-games it can be played in any age environment. 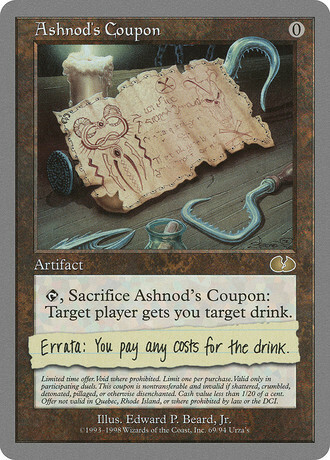 The immediate card that caught the attention of the internet was, of course, Ashnod’s Coupon. At first glance it has an effect that reminds me of the historically annoying Soldier of Fortune: force target player to physically do something. Having a player get you a drink is nice, but the restrictive errata of you paying for the drink is indeed limiting. We want to first focus on enabling the combo, and so we want to be able to fetch the cards as much as possible. 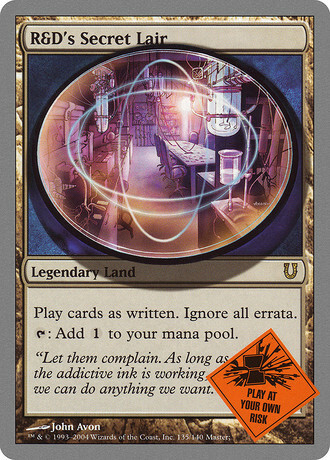 Expedition Map provides us an ability to grab R&D’s Secret Lair, effectively doubling its presence to 8/60ths of the deck. As the land is Legendary, this is more than sufficient for our use. If we don’t draw a coupon, we can fetch it turn 3 with a Trinket Mage. Using the combo is pretty sweet, reusing it is even better. Rather than focusing on looping, I opted for the less cruel option of recycling. Reconstruction will put the Coupon in hand for a repeat. 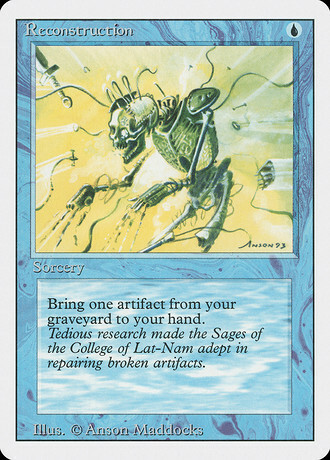 If you’ve happened to have burned through your Coupon’s and Reconstructions (and are still standing), you can use Feldon’s Cane to refresh the deck. Most of the time is spent keeping your opponents creatures at bay so you can maximize your Coupons. For this we have Unsummon, Cyclonic Rift, and Capsize. Monastery Flock can handle the fliers while hiding as a 2/2 until needed. Thing in the Ice can handle the ground, while also acting as a finisher when firing spells (which are also recycled a la Feldon’s Cane and Capsize buyback). After you’ve fetched your Coupon with the Trinket Mage he is a solid chump. But remember, you only want to bust out this deck if you're not the designated driver! Player since '94 that loves limited, kitchen-table, and chaos. Winemaker & Attorney in the real world. How did Dragon Stompy get its name? The Eternalist, Joe Dyer, lets us know in this month's installment. Ethan Saks talks us through his gameplay decision making processes from a recent Core 2019 draft.